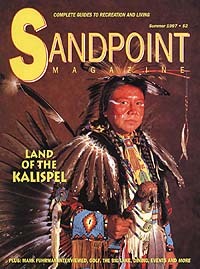 In May 1990 Chris Bessler returned to Sandpoint after having worked on magazines in southern California and in public relations in Pennsylvania. The former editor of the Sandpoint Daily Bee and Bonners Ferry Herald, Bessler had dreamed of moving back to the area with his family, wife Sandy and their young son, Nate. Soon after he formed Keokee Co. Publishing, he started working towards publishing his own magazine, covering lifestyle and recreation for tourists and locals alike. 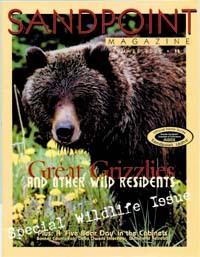 Ten years and 20 issues later, the magazine has helped lots of people get more out of Sandpoint. And in doing so, its provided a valuable reference about our area, an almanac if you will. 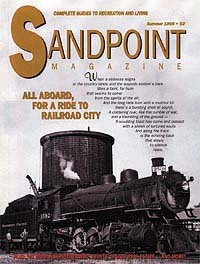 Following is a march through the years highlighting some of the topics covered in Sandpoint Magazine as well as the changes in our town and Bonner County. 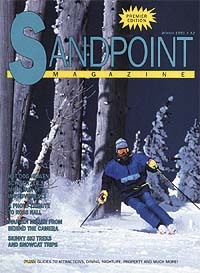 Schweitzer opens the 1990-91 ski season with a mountain of improvements: The Great Escape high-speed detachable quad opens as does the new Headquarters day lodge and the five-story deluxe Green Gables Lodge. Night skiing is launched, and the T-bar is replaced by Chair 2 on the beginners run. Schweitzer enters a consulting agreement with Vail Associates to help the mountain carry out its ambitious 10-year, $100 million development plan. Outdoor humor writer and Sandpoint native Patrick McManus writes a feature on exploring Schweitzer before it was a ski resort. As I tramped alone through the dark and cold, I became certain of one thing: Schweitzer was no place to be in winter! he wrote. The Festival at Sandpoint celebrates its 10th anniversary. Schweitzer turns 30; it opened on Dec. 4, 1963 with Chair One, a rope tow and the original day lodge. The Cedar Street Bridge celebrates its 10th anniversary of replacing the dilapidated, closed wooden bridge that had been an eyesore in Sandpoint for years. We had to search all over Idaho and Montana for standing, dead tamaracks large enough for the project, said Scott Glickenhaus, the Bridges developer. A stoplight is added at the intersection of Highways 95 and 200; Sandpoint had been a 2-stoplight town since 1960. Coldwater Creek, the mail order giant based here, turns 10 years old and enjoys its second year on the Inc. 500 list of fastest growing businesses in the nation. I dont ski, hunt, fish or even hike. I work, said Dennis Pence, founder of the company with his wife, Ann. Swans Landing, a waterfront restaurant, is built at the south end of the Long Bridge. Ed Keinholz, a world-famous sculptor and Hope resident, dies. Gunther Schuller, artistic director for the Festival at Sandpoint, wins a Pulitzer Prize. Three more stoplights are installed at Fifth and Pine, First and Pine and Fifth and Larch. Coldwater Creek leases the entire Cedar Street Bridge for its retail outlet and moves its company headquarters from the present City Hall building on Lake Street to McGhee Road in Kootenai. Mark Fuhrman retires from the Los Angeles Police Department and moves to Sandpoint amid controversy over his role in investigating the double-murder charges against O.J. Simpson. Sandpoint resident Stephen Lyman, a famous painter for The Greenwich Workshop, dies in Yosemite National Park at age 38. Farragut Navel Training Station remembers its 50th year since decommissioning after World War II. Nearly 300,000 naval recruits trained there, which is now a state park. Parts of Dantes Peak, a film starring Pierce Brosnan and Linda Hamilton, are filmed near Sandpoint. The old Sandpoint Marina building is completely renovated by Ralph and Sandy Sletager and reopens as The Old Power House. Sandpoint photographer Duane Cap Davis dies at age 69. Wal-Mart opens in Ponderay, and another stoplight is installed on Highway 95. The POAC Arts & Crafts Fair celebrates its 25th anniversary with Augusts event. The Lazier Center goes under construction in the village area at Schweitzer. North Idaho Bikeways completes the bike path from Sagle Road to the Long Bridge. Panhandle State Bank opens branches in Priest River and on Kootenai Cut-off. The first annual Sandpoint Slam basketball tournament is held. Two more stoplights are added  Boyer and U.S. Highway 2 and Division and Highway 2. Starbucks builds a new coffee shop on First Avenue. Harbor Properties purchases Schweitzer on Dec. 31 after its offer was stymied for two years during receivership. Cinde Borup, partner with Beth Pederson in the duo Wild Roses, dies at age 51. At Schweitzer, the Green Gables Lodge is renovated, turned into condominiums and renamed The Selkirk Lodge. The expansion at Connies Motor Inn, now Hawthorn Inn and Suites, is completed surrounding the historic Tam OShanter Tavern on Cedar Street. It will stay right where it is, as long as its in the family, said Tam owners Leonard and Helen Haugse. The East Bonner County Library moves to its new home at Division and Cedar. Jalapeños and Second Avenue Courtyard open in the former Elks Lodge.